According to the American Academy of Dermatology, the natural hair growth cycle means you shed between 50 and 100 hairs daily. If you're experiencing far greater shedding than this, it could be a result of outside stressors, including a dramatic change in your diet. A low-carb diet may temporarily increase the rate at which your hair sheds as your hormone levels adjust and your metabolism shifts to burning more fat. If you're not just losing hair but experiencing serious breakage or bald patches, consult your physician to determine the cause. The life of a single hair has four separate stages. The anogen phase, when your hair is actively growing, usually lasts between two and seven years. The short 10-day catagen phase is when the hair follicle shrinks and growth halts. 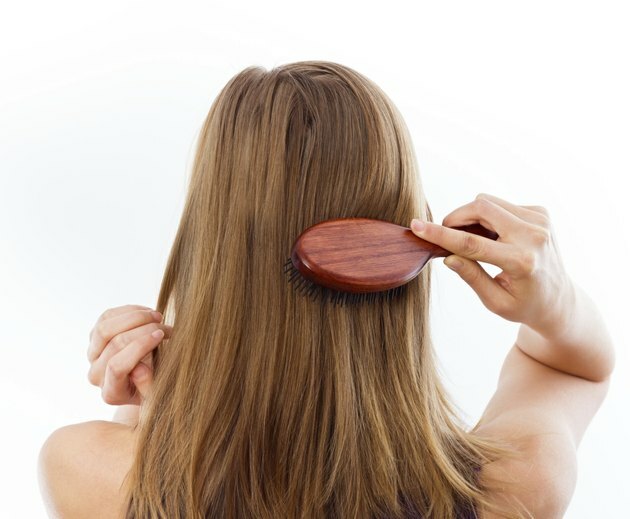 Next is the telogen phase during which the hair rests for about three months; it stays attached to your head, but a new growth begins underneath it. The final phase is the exogen phase in which the hair finally detaches from your body and is shed. About 10 to 20 percent of your hair is in the telogen stage at any given time, while the rest is actively growing, according to the American Hair Loss Association. Your hair's normal transition from the anagen to telogen phase is sometimes expedited due to stress. A stressful event, like the death of a loved one, certain medications, serious illness or a major dietary change can prompt more hairs to reach telogen faster, so you experience greater hair shedding than usual. This is called "telogen effluvium" and, if related to your low-carb diet, should be temporary, lasting just two to three months. It's subtle enough that others won't notice that you're losing hair; only you will see extra strands in the sink, shower and hairbrush. You're less likely to experience hair loss on a low-carb diet if you consume enough calories and don't go into starvation mode. The average woman needs at least 1,200 calories per day and the average man 1,800 -- even when trying to lose weight. Especially active people may need more calories to fuel activity and prevent muscle loss. Avoid limiting your fat intake as well as your carb intake. Your low-carb meal plan should consist of a variety of meats, poultry and fatty fish; olive and coconut oils; occasional nuts and avocado; butter; and watery, fibrous vegetables. Keep your stress levels low when you begin a low-carb diet. Avoid beginning during a week of work deadlines or during a move. Aim for the requisite seven to nine hours of sleep per night, and avoid a big change to your workout schedule. Anemia, recovering from childbirth and the after-effects of surgery can cause temporary hair shedding, too. If your hair stops growing altogether and is leaving you with bald patches, consult with your doctor or dermatologist. Sometimes you can stop this loss with something as simple as changing hairstyles or hair-care products. In other cases, your loss could be hereditary or due to an overactive immune system. American Academy of Dermatology: Do You Have Hair Loss or Hair Shedding? Diet Doctor: Can Low-Carb Diets Result in Hair Loss? What Causes Hair to Fall Out of a Beard? What Are the Causes of Thinning Lashes?